This was a complete trial run for this recipes, not sure what the outcome was going to be, but overall I was very impressed with myself. There are a few things I will change next time I make it, otherwise quite the success! It’s time consuming, and does require that attention to detail and good time management but the end result is succulent! The runny egg yolk and ricotta, mixed with the pancetta sage butter sauce dances with your taste buds! Place the ricotta and Parmesan in a medium bowl, season lightly with salt and pepper, and stir to combine. Transfer to a Ziploc bag and place in the fridge. Cook the pancetta in a medium frying pan over medium heat, stirring occasionally, until browned and crisp, about 10 minutes. Using a holey spoon, transfer the pancetta to a bowl lined with paper towel and set aside. Drain off and discard almost all of the fat from the pan but leave only a thin coating and any browned bits on the bottom of the pan – set aside. Bring a large pot of heavily salted water to a boil over high heat, and heat 1 double boiler to steam the asparagus. 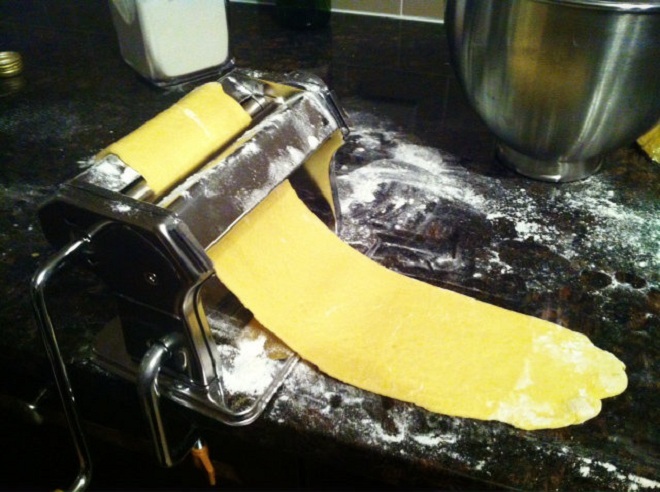 Set up your pasta machine – either an attachment for a stand up mixer or a manual one. Cut the dough in 4 pieces (this is easier to manage once the dough pieces get pretty long). Roll ¼ of the dough through the machine, using the method mentioned in the Fresh Pasta Recipe, to reach roughly about 1/16 inch thick, and set aside on a lightly floured surface. Continue for the other pieces. 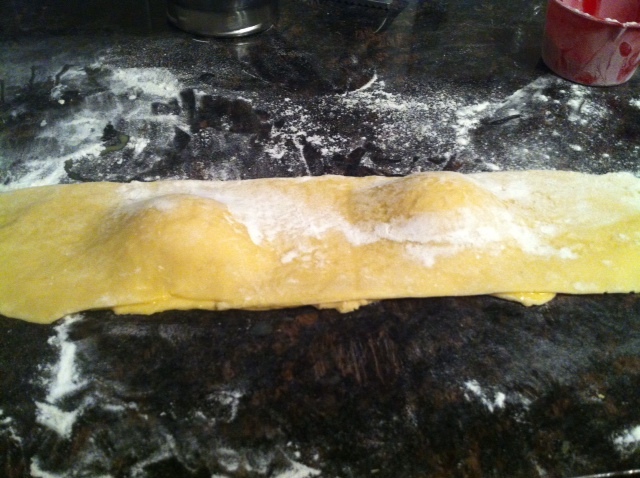 *Note: This was one of my little mistakes, I didn’t roll my pasta thin enough, and it was a little thick. I could’ve rolled it though one more setting, that’s why I’m mentioning going that thin. Remove the filling from the refrigerator and snip a ½ inch hole from one of the bottom corners of the bag. Pipe 3 rings of filling, that measures about 1½ inches in width, leaving the center empty, about 2½ – 3 inches apart, on 2 of the sheets of pasta. Crack 1 egg and separate the white from the yolk. Using the egg shell or your fingers, gently place the yolk inside one of the piped rings, being careful not to break the yolk. Repeat with the remaining 5 eggs and piped rings. 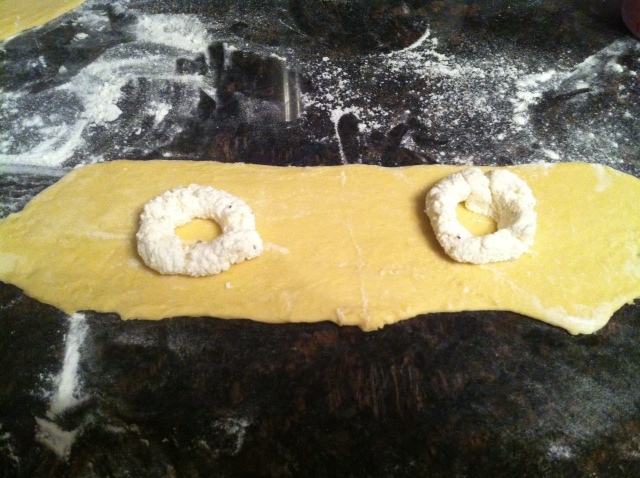 Using a pastry brush, brush the egg-water mixture on the exposed edges of the pasta with the yolk-cheese rings. Gently cover with the remaining 2 pasta sheets by starting at one side of each sheet and draping the pasta over the filling and egg, being careful not to break the yolk. Push out the air pockets as you go and press tightly around the filling and egg yolk to seal. 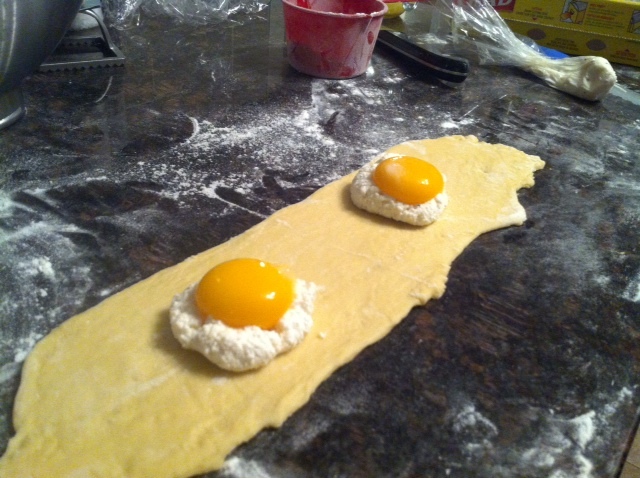 Center the cutter around the filling and egg yolk on each ravioli and cut away the extra pasta. 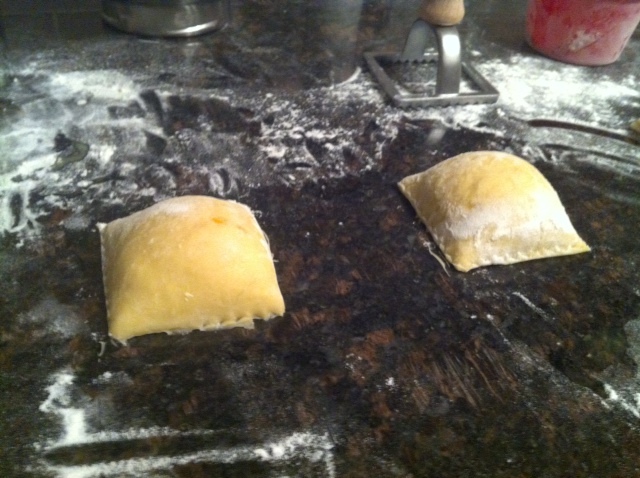 Using a flat spatula, carefully transfer the ravioli to the floured baking sheet. Discard the trimmings. *Note: Next time I’m going to give my ravioli a little bit of a lip, as I noticed that one of them wasn’t sealing properly. Again, this is all trial and error, and you learn from your mistakes. Steam the asparagus in the double boiler. Return the reserved frying pan to medium heat. Add the butter and cook until the white milk solids have browned, about 5 minutes. Add the sage and reserved bacon pieces, season with salt and pepper, and stir to combine. Remove the pan from the heat and set aside while you cook the ravioli. Remove the asparagus from the double boiler, season with salt and pepper, and arrange 4 stalks on 3 plates. *Note: Now I found this to be a little salty with the pancetta and butter combined. 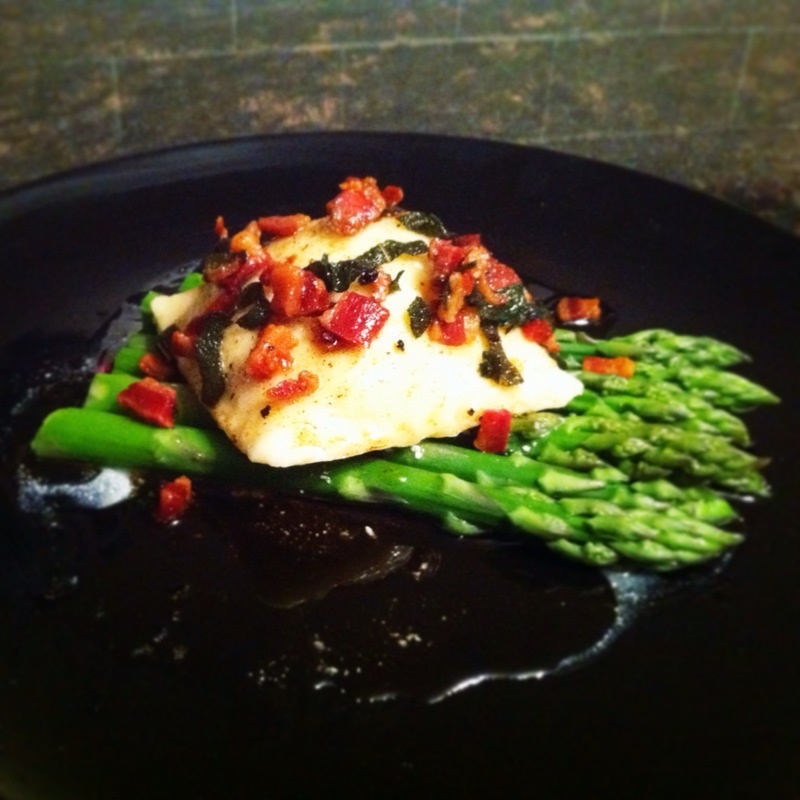 Next time I will add less pancetta or maybe do an aglio olio instead. Gently add 3 of the ravioli to the boiling water and cook until they float and the cheese filling is warmed through, about 2 1/2 to 3 minutes. (Do not overcook.) Remove with a holey spoon. Place 1 ravioli on top of the asparagus on each plates. Gently drop the remaining 3 ravioli into the water. While they cook, spoon half of the sage-bacon sauce over the 3 plated ravioli. Repeat with the 3 remaining ravioli and the remaining half of the sauce. Serve immediately.